IJoy Combo RDA Review | A Great Affordable RDA - Daily Vaping Deals & The Best Vape Product Reviews at Vaping Cheap! The iJoy Combo RDA is a unique atomizer which is designed around not having to use tools to build on the deck and installing your coils. 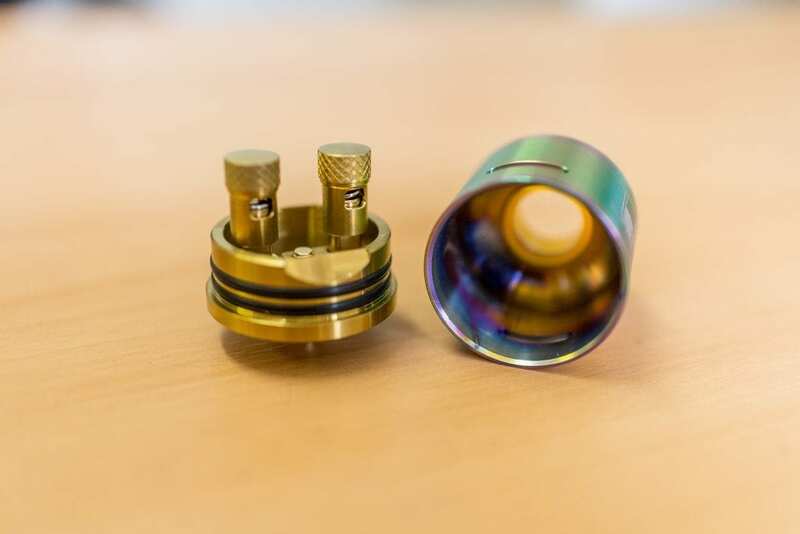 It is a 25mm RDA with a wide bore 810 ultem drip tip included. The iJoy Combo RDA is available in five finishes and also features an adjustable bottom airflow. I would like to thank GearBest for sending the iJoy Combo RDA to us for the purposes of this article. Click Here to Check Out the Combo RDA By IJoy! The iJoy Combo RDA comes in a nice compact black box, reminiscent of most RDA packaging at the moment. Everything is well protected on one level with a foam insert that protects the RDA from being damaged in transit. After opening the box, you will find the RDA, a spares kit which also includes 2 Clapton coils and some cotton for wicking. There are 2 spare springs for the post hole mechanism, which makes me think they may be prone to getting lost or springing out of the posts. I received the rainbow finish and I think it looks very nice in regards to a small 25mm RDA. The driptip is made of ultem which should help with heat on your lips. It is also compatible with other 810 style tips or any goon style tips that you wish to add. The chamber is one piece, which means you have to move the whole thing to adjust the dual bottom airflow. Straight away I see a problem here in that when you adjust the airflow, the coils will not be centered anymore. The airflow is beveled into the bottom ring on the RDA angled up towards to coils. The deck is gold plated and features a dual post design that is quite unique in presentation. The post clamps are spring loaded and have knurled adjustment screws on the top. They do not have stoppers, so they will screw right off and the spring will come out as I suspected earlier. The positive post has a peek insulator underneath and there is no inclusion of a squonk pin in the iJoy Combo RDA. The double o rings hold the chamber on with the correct amount of tolerance. The build quality is superb with no sharp threads or loose connections anywhere. No smell of machine oil throughout the RDA, so quality control speaks for itself here. Overall, a really nice looking RDA and a well manufactured design. Building on the iJoy Combo RDA is not the easiest deck in the world to build on. The reason I say this is because you need to have one hand always providing pressure on the posts to have them open up. The other hand you will be using to install the coil into the post holes. There is a post compression tool which aids in providing to pressure to both posts at the same time and this takes some getting used to. It means you have to install the first coil on one side with one hand and then flip it around to install the other coil. When both coils are in the post holes, it then becomes a slight juggling act to line them up according to how you want them to sit. The good news is that when you have your coils sitting in place, they will not move due to the pressure of the spring loaded post clamps. Once you screw down the tops of the posts, then you can finalize your build according to your preferred method. Wicking is the same as pretty much any other RDA out there. Cut your wicks to ensure they touch the bottom of the deck and it is good measure to roughly measure them out, as this RDA does have a deep juice well. I have to say that the flavor and vapor production from the iJoy Combo RDA is stellar. The flavor is nice and condensed due to being such a small 25mm RDA height wise. The slight dome shape to the barrel also helps here in my opinion. The vapor production is very commendable, being thick and dense. I tested the iJoy Combo RDA with the included Kanthal Clapton coils that it shipped with. Being Kanthal, I ran them in wattage mode at around 75-80 watts. The build came in at around 0.30 ohms and was very satisfying. I wouldn’t describe this RDA as being airy, however it is also not restrictive. Somewhere in the middle would be the best place to describe it. I do have a gripe that when you close down the airflow, it is not centered to directly hit the middle of the coils. At any setting, the airflow is still however smooth. I would have to say that the iJoy Combo RDA is one of the top performing atomizers available on the market at present, so well done here iJoy! Temperature wise, the ultem drip tip and the peek insulator really do a good job keeping the iJoy Combo RDA as cool as it can be. Another benefit of the wide drip tip is that can drip directly down onto the wicks through the top, without having to take off the barrel. I did not experience any ohm jumping or mis-behavior from this RDA at all while testing it. It is quite compact for a 25mm RDA, so portability is not an issue. The iJoy Combo RDA is going to fit into your everyday life if you are an on-the-go dripper. I would have liked to have seen a two part barrel and top cap situation in the iJoy Combo RDA. This would solved the issue of the off center airflow, however it may have detracted from the simplicity of this design or increased production costs. 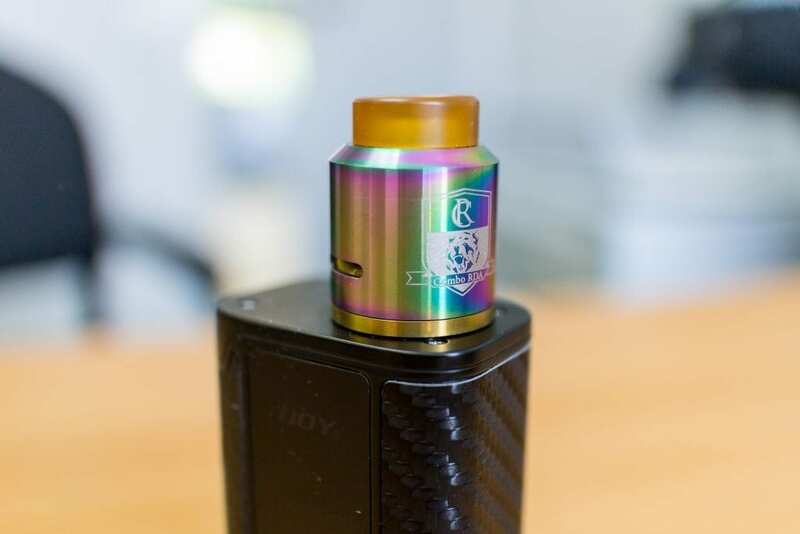 I would have also liked to see a squonk pin included in the kit as squonking is definitely becoming increasingly popular in the vaping scene these days and I believe this RDA would be a great squonking contender. All in all this is a great performing little 25mm RDA. The iJoy Combo RDA would be handy to have while travelling as you can build without carrying tools with you. All though you may still want to take some wire cutters to trim your coil legs, unless you do that before you go. For the price I really think this is worthy piece of kit. There will definitely be a place in your arsenal for this, for both experienced and budding vapes alike. Beginners may struggle to start with in terms of being able to build on this, however experienced vapers will totally own it. So if the iJoy Combo RDA sounds like something you are interested in looking into, I can totally recommend you pick one up. You will be satisfied with it flavour and vapor production. I hope this article has helped you in your quest for your next new RDA. If you have any questions or comments, please leave them below. We always love hearing from our dedicated audience here at Vaping Cheap.